Bennie F. “Poppy” Hash, passed away April 22, 2017, at Olathe Hospice House. Celebration of Life will be 11:30 am Wednesday, April 26, 2017, at Bruce Funeral Home, Gardner, 913-856-7111. Private family burial at Stony Point Cemetery, Vinland, KS. Memorial Contributions may be made to Kids TLC in Olathe or Shriners Children’s Hospital. Bennie was born April 21, 1929 in Chelsea, OK to Grace Mary (Starns) and John F. Hash. He grew up in Oklahoma. Bennie served in the U.S. Navy from 1948 – 1951 and earned the rank of Commissary Seaman. Bennie moved to NW Missouri where he met Mary Ann Grindstaff. They were married on January 14, 1956 in Fairfax, MO. They moved to Gardner in 1970. He was an over the road truck driver for 40 years for American Freight of Kansas City. Bennie was a member of the KCMO Local 41, and 710 Teamsters in Chicago. He enjoyed camping with the family, fishing, watching birds, especially purple martins and listening to doves. He also enjoyed tinkering with antique tractors, gardening and spending time with his family. He will be dearly missed by his family and friends. He was preceded in death by his parents, siblings Elizabeth Wilson, Charles Hash and Josephine Alberts. 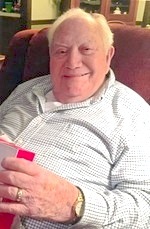 Bennie is survived by his wife Mary of the home; children: Chris Hash, Terri Stacy and husband Wes, Bennie Bruce Hash and wife Megan, all of Gardner, Martin Hash and wife Kay of Lawrence, KS; siblings Katherine Robinson and Carolyn Robinson, both of MT, Cora Livingston and Hugh Hash, both of Nowata, OK; 13 grandchildren and 13 great grandchildren.